Pembrokeshire artist Maggie Brown, born into a farming family in the midlands, has always worked in an artistic capacity ever since achieving a BA in textile design at Winchester school of art in 1979. 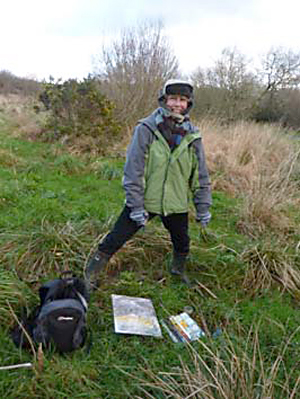 Central to her work is her love of the outdoors, the natural world and nature conservation. Since she and her family’s move to Pembrokeshire in 2004, she has painted the special landscape in all its wild glory, the elements and the unique light, by using colour, surface pattern and texture, with a variety of media. For the last ten years Maggie has been committed to enthusiastically teaching painting techniques and sense awareness of landscape, seascape painting to their guests at www.indigobrown.co.uk residential painting holidays and in doing so, has nutured, explored and developed an emotional gut response to the landscape which she feels, hopefully, has given a refreshing integrity, a gritty portayal to her work. Always have done, always will! …..and now I like to think that you, the viewer of my paintings, can be caught up in the battling elements, a storm at sea, or perhaps the effects of light, in a glade of a wood, over a bog, even a scrubby moor, a ray of light through a hedgerow, a moth, a chough caught in a gust of wind… to me, it’s a mommentous exciting glimpse of life and deserves preserving. I want my interpretation to give meaning and poinency to these often, unreguarded places. I work with sketch books on location, my sketch books are very precious to me, they are a wealth of information that I have collected over the years, in all weathers! containing outdoor sketches, scribble and drawings, ideas on composition and tone, …….and lots of words, these more recently developed into haiku poems as a title for the paintings. I like to play with a combination of medium, acrylics with texture, and watercolour in a non traditional sense, with wax/oil pastels and gouache, as well as continually exploring composition and scale and size of paintings, from small studies to large paintings on 300lb paper and mdf boards/frame made to a high specification. My paintings are a record, capturing quiet times of observation, of wild scrubby moors and intimate details of hedgerows, places so disregarded, that I feel they deserve a second glance and need be preserved by conservation and interpretation. I love nature, in the raw, and I am passionate about nature conservation, the move to pembrokeshire was initially to get back to nature and maybe, just feel, I am able to make some minute difference in preserving our wildlife and countryside by ‘what i do’ in the garden and how I live my life, and how my paintings may help, to remind the viewers of the beauty we so often pass by….